Harhotep was asking about Nefermaat and his children. Some sites claim some 12 sons and 3 daughters. Her name Itet appears in front of her lower legs. Another known son is Hemiunu. I really must thank you for your question. I found all names of their children, and thank you for pictures. I really don't know where you find them, but they are beautiful. I found that they really had 3 daughters, but many more sons - 15! On some pages there is written that Nefermaat had no 15 sons, but 15 children all together. Prince Hemiunu Likely the same person who would later become Vizier. Hemiunu was buried in Giza in Mastaba 4000. King’s son of his body, Chief Justice and Vizier, etc. Son of Prince Nefermaat and his wife Itet, and thus grandson of Seneferu and Hetepheres I. A tatue of Hemiunu is now in the Pelizaeus Museum in Hildesheim. Hemiunu is depicted in a limestone statue, ca 1.5 meters high. I have seen the names of Buneb, Shepsesneb and Nebkhenet on the internet, but I have not been able to find those names in the literature. If you click on the individual chapels etc, there are links to the tomb decorations and you might be able to find the depictions of the children. 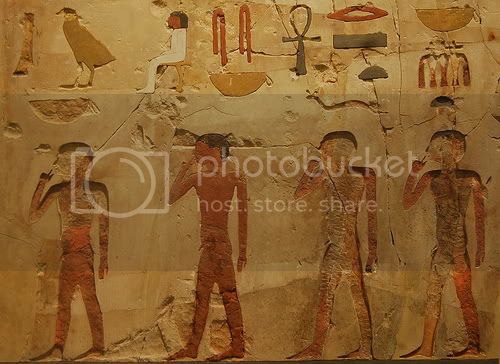 Your first image shows a boy named anx-r-fnD(=f) 'ankh-er-fenedj-(ef)' ("Life is on (his) nose"). See Ranke 17, second variant. The name of the third boy (pic bilow) is anx-r-Sr.t=f 'ankh-er-sheret-ef' ("Life is on his nose"). See Ranke 18. It's one of the scenes from the chapel of Nefermaat. On the bottom at the right hand side there is an image of Princess Djefatsen and there is an image of Princess Pargeti there as well I think. I wonder if Buneb is a mistaken transliteration of the name of the boy on the left with the baboon behind him. I think the three glyphs by him could be mistaken for "Buneb" (one would have to misidentify the ox leg as a human leg and the knife for a neb basket). I'm pretty sure the name is not Buneb though. I think that may be Wehemka? I must again thank you on your informations! You wrote this "Princess Pargeti". Was what her name - Pageti or Pargeti, or maybe the both? Also I wanna ask something about Nefertkau. On yor page I found that Nefertkau, dughter of Seneferu, bore Nefermaat II. So, if I understand, there where two Nefermaats - one who is son of Sneferu and one who is son of Nefertkau and so nephew of Nefermaat I? Also, prince Ankhhaf had a wife Hetepheres. Was she Hetepheres II or some princess? FOr as far as I know Nefertkau had a son Nefermaat II. G7060 Nefermaat II Time of Seneferu – Khufu? King’s son, Hereditary prince, Overlord of Nekheb, etc. Vizier of Khephren. If you go to http://gizapyramids.org/ and do the search you will find linked articles you can download. Reisner, George A. "Nefertkauw, the Eldest Daughter of Sneferuw." Zeitschrift für Ägyptische Sprache und Altertumskunde 64 (1929), pp. 97-99. 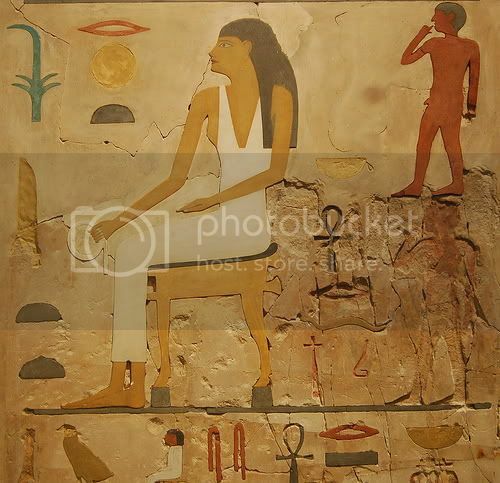 I think Ankhaf's wife Hetepheres would be some other lady. She is a King's Daughter. So she may very well be a daughter of Sneferu. That would make her a (half?) sister of Ankhaf.